Radisafe is best and non expensive EMF Protection or EMF protector for the mobile phone. scientifically proven that this can sometimes cause cancer of the brain. EMF protection RadiSafe Chip Eliminates at least 80% of the Heat and mainly 99.95% of Elecromagnetic Radiation emitted by your phone. After considerable research we have found out that certain earth Minerals have the capability to successfully Harmonize the Radiation / EMF and reduce the Heat of the Mobile Phones. We have employed this unique Mineral Technology plus SCALAR TECHNOLOGY in creating this “need of the hour gadget” RADISAFE and presenting it to you for your protection. RADISAFE is Certified by the World renowned Electronics Measurements and Devices Testing Laboratory CIEMS – CALIFORNIA INSTITUTE OF ELECTRONICS AND MATERIALS SCIENCE, California ,USA to possess Electromagnetic Shielding Effectiveness of 99.95% when tested at the Frequency of 9.375 GHz . 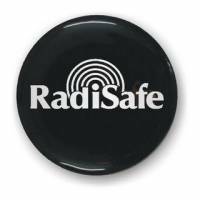 One must be aware that currently latest GSM and CDMA phones are operating at a maximum Frequency of 2100 MHz (2.1 GHz) only, whereas RADISAFE is tested to shield Radiation even at a Frequency of 9.375 GHz . When RADISAFE is stuck on the ear piece hole of the mobile or on the front side or back side of the Mobile Phone as nearer to ear piece as possible , it immediately starts to Shield Radiation and reduce heating of the Mobile Phone, thanks to the Mineral Technology and Scalar Technology employed in RADISAFE.